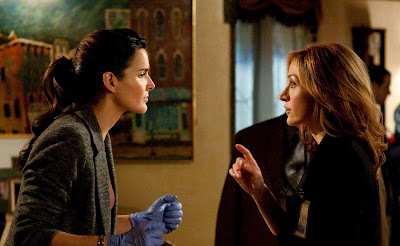 After greenlighting a pilot, TNT has ordered ten episodes of RIZZOLI & ISLES. Here is the first look at the upcoming TNT series RIZZOLI & ISLES. Click on the image for a larger picture. RIZZOLI & ISLES is based on characters from the novels of Tess Gerritsen and is about Det. Jane Rizzoli (Harmon), a Boston Homicide detective that works with Medical Examiner Maura Isles (Sasha Alexander). Also on board are Lorraine Bracco (THE SOPRANOS) as Jane’s mother, Jordan Bridges as patrol officer Frankie Rizzoli Jr, Jane’s younger brother who is described as idolizing his sister and hopes to follow in her footsteps. Bruce McGill (MY COUSIN VINNY, ANIMAL HOUSE)is Jane’s former partner Vince Korsak, who is “gruff but loveable” and is a little hurt by Jane taking a new partner. McGill might be best known as D-Day from ANIMAL HOUSE. Lastly, the aforementioned new partner is newbie Barry Frost. Lee Thompson Young is playing Frost. Lee plays Agent Al Gough on ABC’s FLASHFORWARD. when does it start?? Ive started reading the books and they are great. I like both these actresses as well, and love Tess Gerritsen's books. However, if you've read the books neither of these actresses fit the images we have in our minds because of the way the author has portrayed them. Jane is short and a little stout and Maura is lean, lanky with black hair as I remember. I still am looking forward to checking out this new series. Love both the actresses, particularly Sasha Alexander. And read all of the books in the series – bound to be a killer show. I love the books but I fear for the tv series due to the choice of Angie Harmon for the role of Jane. She is a terrible actress with a very irritating voice. She has never been good in anything she has done but I will give it a chance. Maybe she has taken some acting lessons and coughed up some phlegm. Can't wait for this. I've read all in this series.